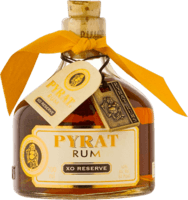 Solid Barbados rum This rum has a dark golden colour with a medium strong (alcohol) smell. The flavour is dry and strong... A nicely aged sipper. Ye Old Grog it's not - This is Good Rum! First of all I love the cloth sack it comes in - Nice! That said the bottle label is nice too - I'm a sucker for pictures of old time sailing ships. Disappointed for sure... This rum is fairly expensive, being more than twice as costly as a good Caribbean / Central American rum, so I was expecting something good. Instead.